I needed to have some "guy" cards in my stash! Love this new E870 Hound Dog. I stamped him with kraft ink and embossed him with clear embossing powder. Then I fussy cut the image and popped him up with foam tape onto some die cuts. I added the B247 Happy Birthday sentiment, also embossed with the C478 Born to be Wild sentiment! Ha ha ha....that pooch doesn't look wild at all! 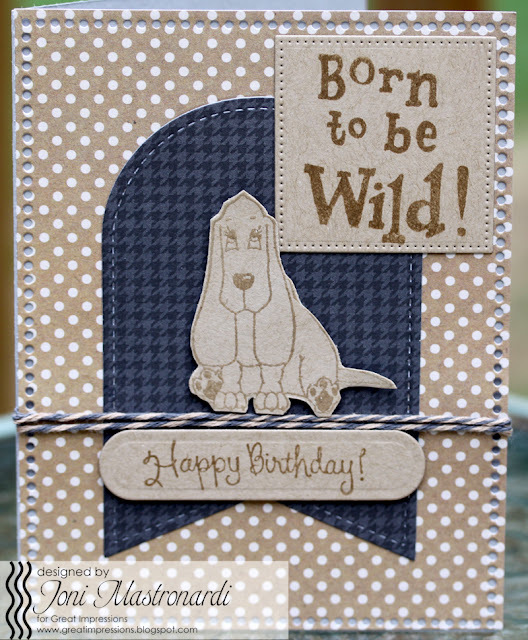 What an uber-fun card, Joni! Thanks for sharing!